Hey there. 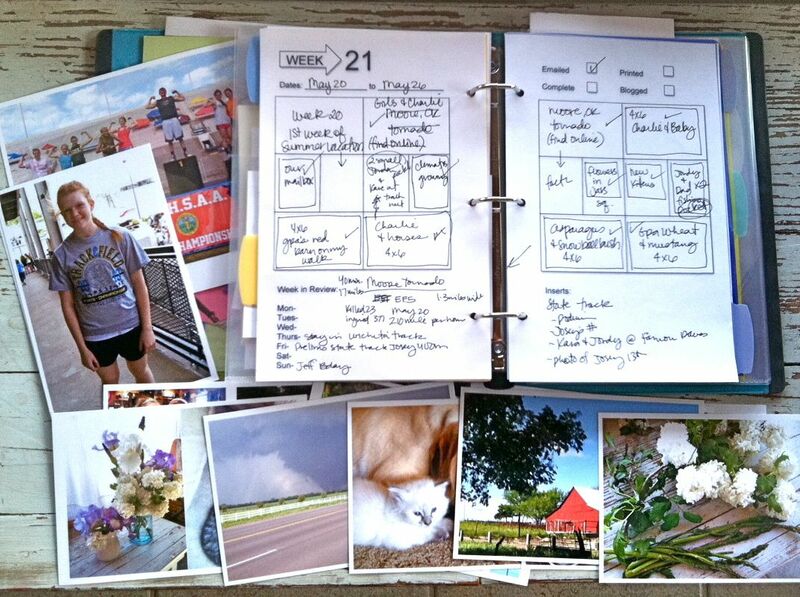 Today I'm sharing Week 21 of my Project Life 2013. As I'm getting caught up with my album I thought it would be fun to share a photo of my weekly sketch. 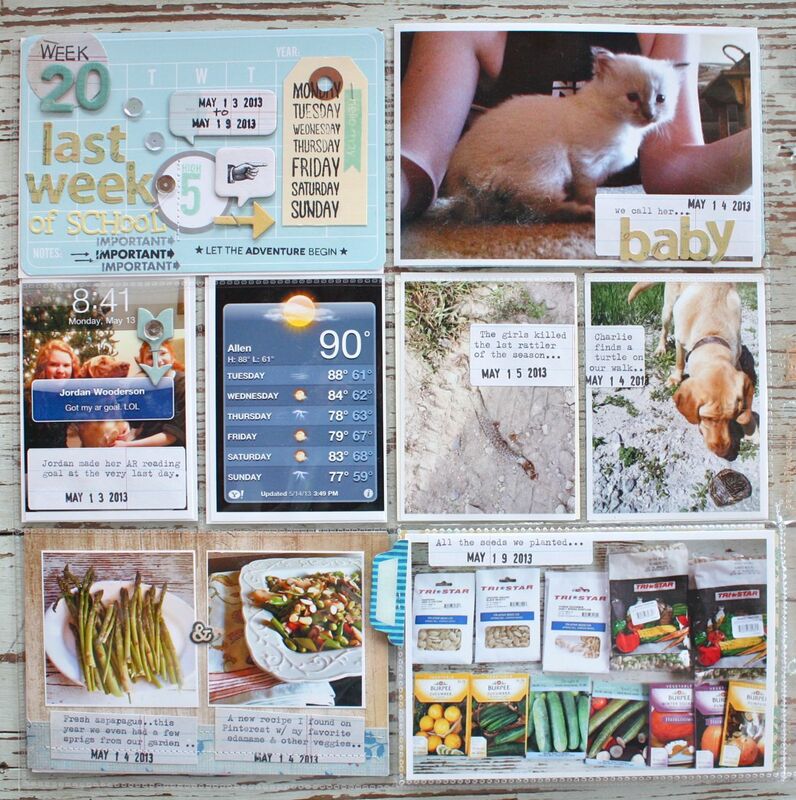 I've created a new organizing system that has helped me immensely in keeping track of photos, collected items, weekly events and more. I'll be sharing my entire system soon in hopes that it might be helpful for you too. I have 2 inserts this week. 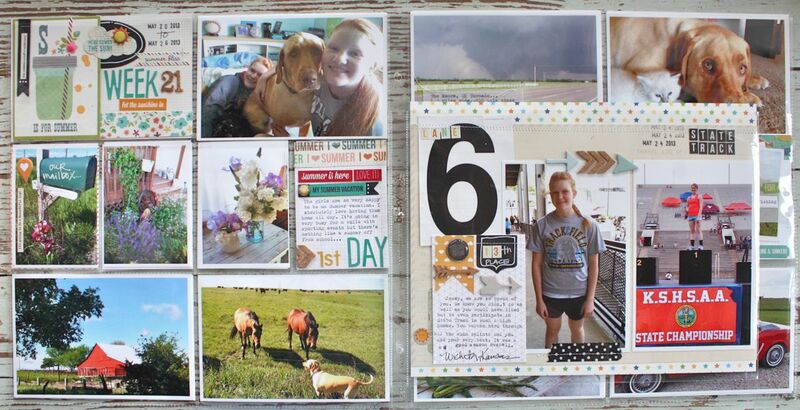 One is shown below and another is the Summer Bucket List page I did in this post. Here's the two page spread without the inserts. The left page. 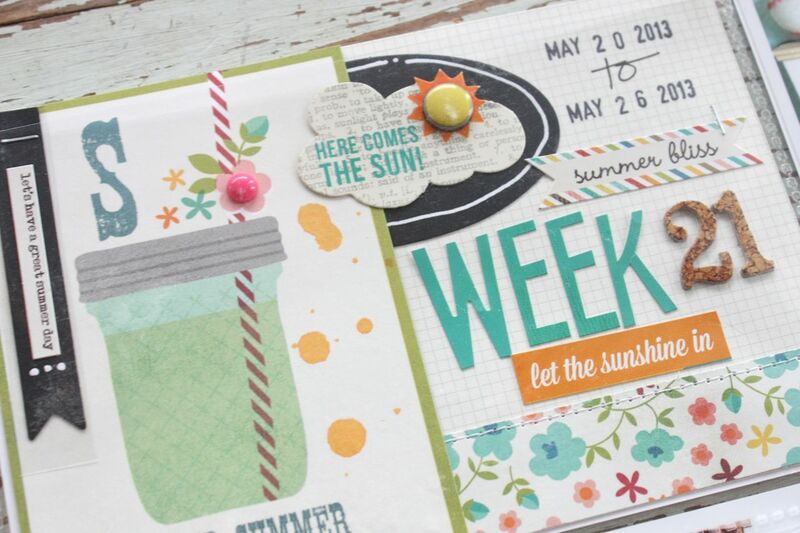 This was the first week of Summer so I loved using the little mason jar glass with the Summer theme. There was lots of everyday type photos, just life around the homestead. The Moore, Oklahoma tornado was big in the news and I'm always freakishly aware of the weather. So that made my pages this week too. The main dated insert used most Simple Story elements from the July Gossamer Blue kits. I added in some of the chalkboard stickers with white gel pen details, brads, stickers and enamel dots. A few photos from around the yard. If you write very slow the white gel pen works great on photos. A journaling card noting the first day of Summer vacation for the girls. 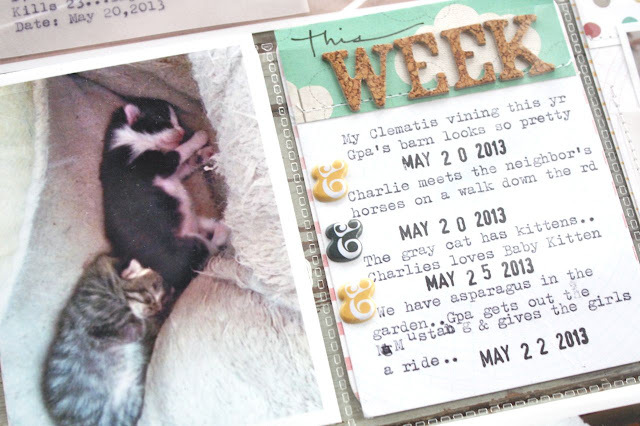 New kittens and a fun twist on a Week in Review card. I changed things up and added this to the right page of my spread. Instead of writing on every photo I just listed my events in a list format with the cute ampersand puffy stickers. Here I had some events with multiple, small photos. 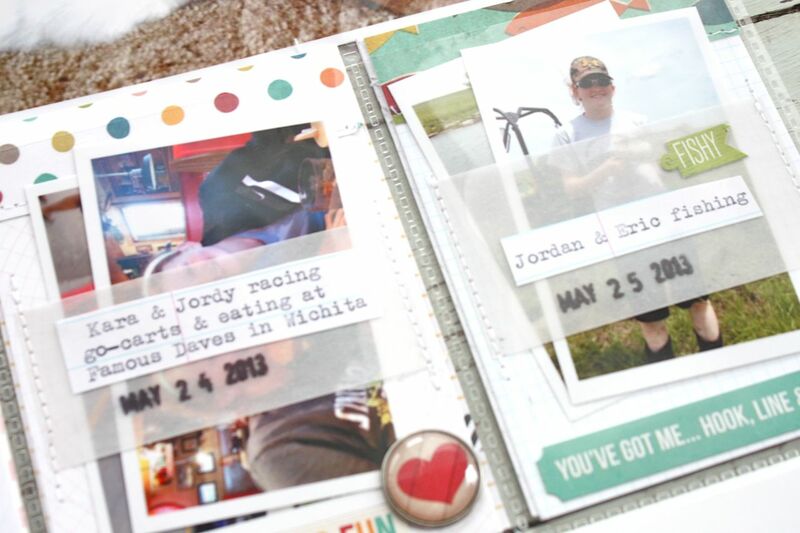 I stitched vellum strips to my journaling cards to create bands that my photos could slip behind. I used labels from my shop with typewriter journaling and my date stamp. 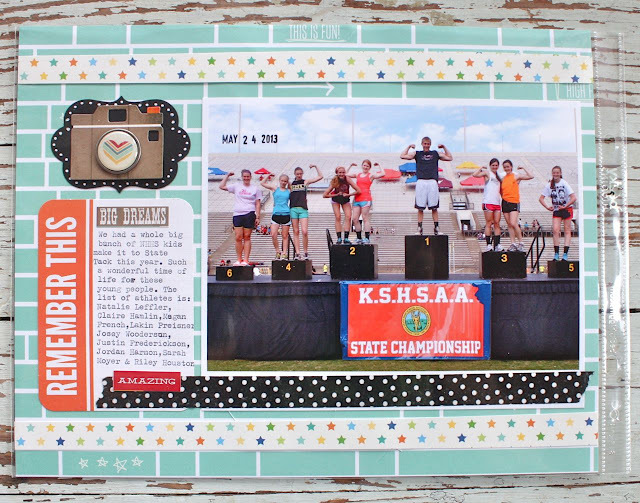 This is an 8.5 x 11 horizontal insert of Josey's State Track Meet. I captured a few fun photos and included her number that she wore while running. 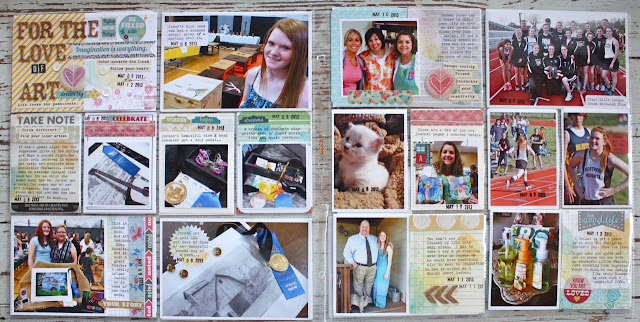 I used a journaling card that I had in my stash to type my journaling for this page. I added brads and arrows. This is the back of the insert which features all of the kids that made it to State from our high school. I loved this shot of the kids so I enlarged the photo and included all the kids' names. 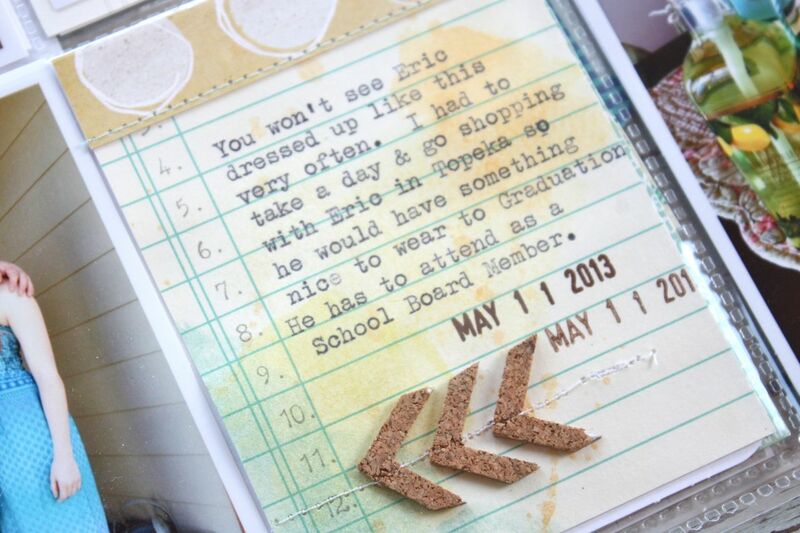 I used another 3 x 4 journaling card for typed journaling. 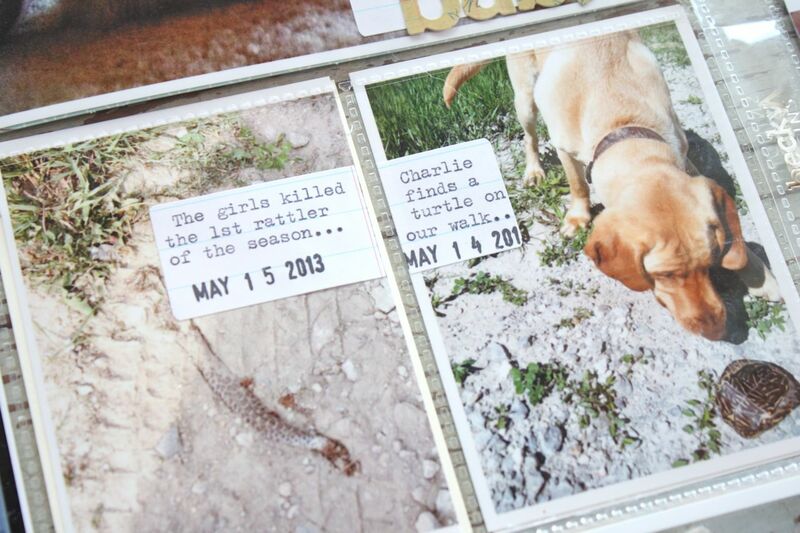 Here's a shot of the inserts in between this week's regular pages. I always try to keep my inserts smaller than 12 x 12. This way I can see the main inserts and know that everything in between is extra stuff that went on this week. Hope you're enjoying my Project Life pages. 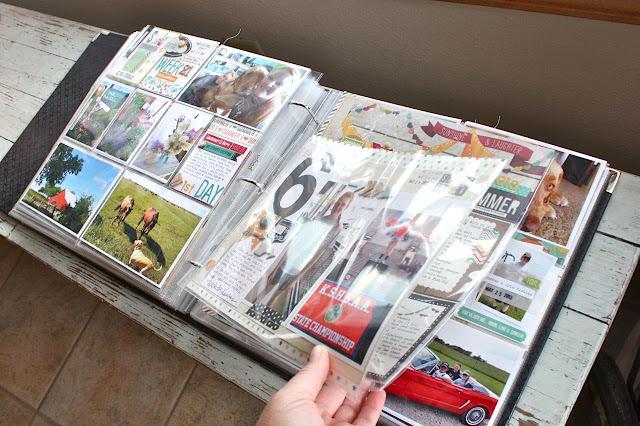 Would love your feedback about what you like to read when browsing Project Life posts. Do you like lots of photos, less photos, etc. Thanks to all of you who leave comments here regularly. I so appreciate the time you take to leave a comment...something I definitely need to get better about myself. We're heading back to Colorado soon for my nephew's wedding and some vacation time. 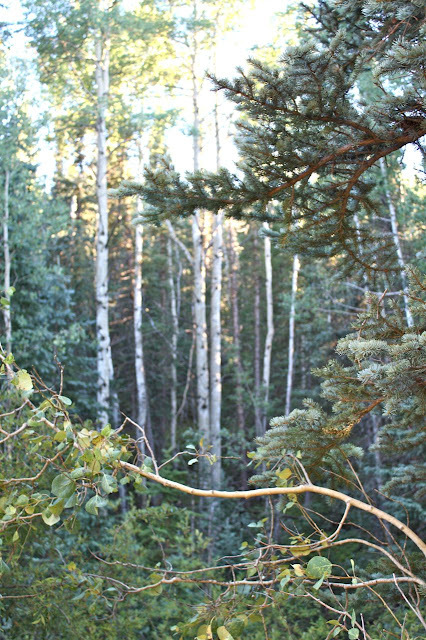 I can't wait to get back into the beautiful scenery and to wake up to those cool mountain mornings. We've got a white water excursion planned + we're renting some ATV's for a day. 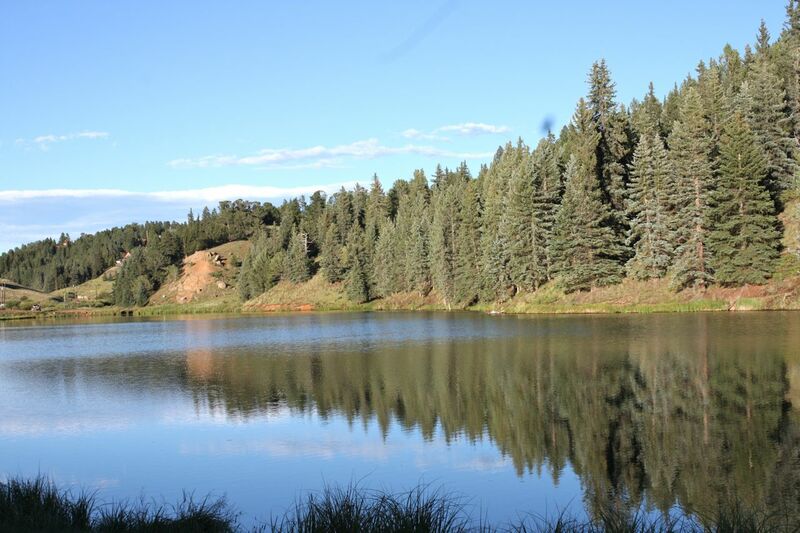 We've got a wonderful house/cabin rented in a secluded spot for a few days too. The down time will be so wonderful after the hectic schedule that the girls have had this Summer. So I have a question for you guys. Do you know some good hot spots for awesome restaurants or great little scenery spots near the area we'll be staying? On our vacation to South Dakota you all gave us some great suggestions because after all, the locals and those who have been there know the places best, right? We'll be staying near Divide in our cabin and have some places mapped out but would love to see if there's anything we're missing. We've done all the tourist spots around Colorado Springs and are quite familiar with those sites so we're looking for something new to do. I do remember a restaurant in Colorado Springs that was featured on Diners, Drive-ins and Dives but I don't know the name. From Divide we'll be heading up to the wedding venue which is near Castle Rock. I see that an IKEA is near Centennial which isn't too far way. Is it worth the jaunt? Would love to hear from you and thanks in advance for your suggestions. Lots of blogging going on around here and I'm continuing today with Week 20 of my Project Life 2013 album. I'm trying to get all my posts caught up here because in August.....hang on to your hats. 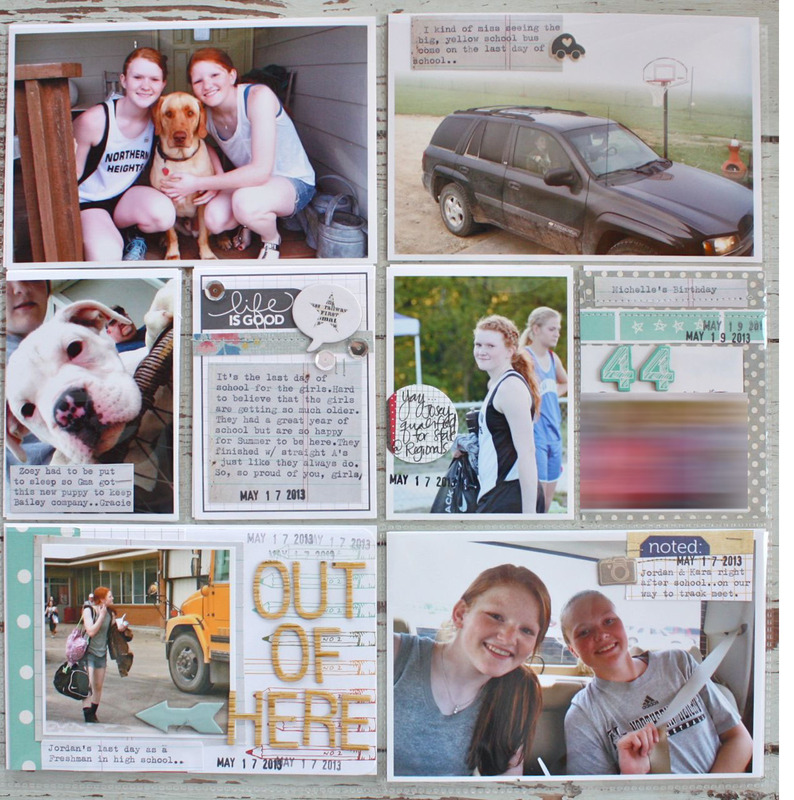 As soon as the girls get back in school, I'm planning to offer up more Project Life fun. I'll be kicking things off by introducing you to the first Gossamer Blue Life Pages kits. 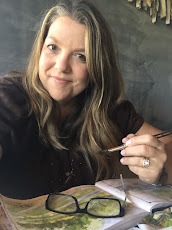 I'll be showing you my project pages all month long + I'll be introducing in more Project Life topics....like my reorganized PL work area, my new PL planner book and more. So hang on while I get my weeks caught up a bit here on the blog. 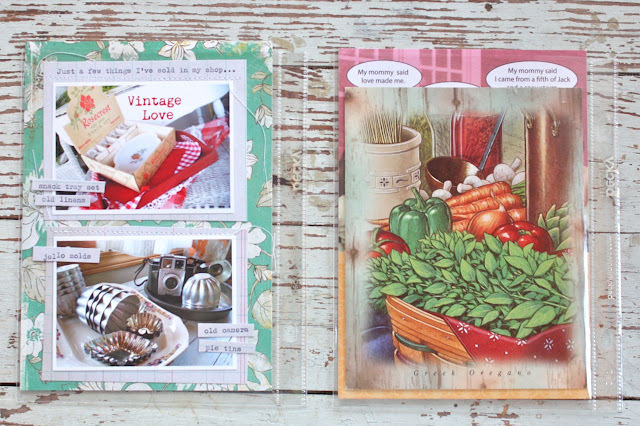 :) Card makers....don't worry, I have lots in store for you too here on the blog like new kits, fresh cards, etc. Okie doke, here's Week 20. We were wrapping up the school year here and the kids were itching to be done with classes. Gardening season was upon us..everything was fresh and green. 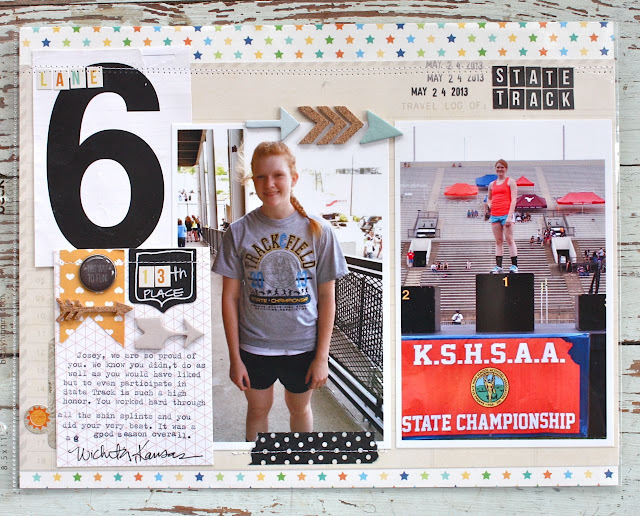 Josey was finishing up track season which still lasted past school for a week or so. Summer vacation was just around the corner. My main dated insert. 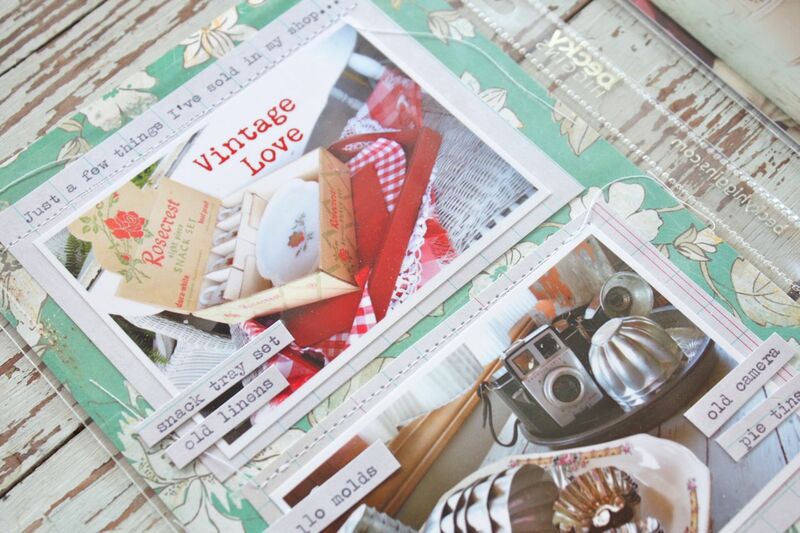 Lots of stickers and chipboard, some stamps from Studio Calico, a Small Manila Parcel Tag from my shop. I've been combining 2 similar photos on one 4 x 6 insert lately. This saves space instead of using up two slots. For convenience since they're sticky backed, I've been typing journaling onto Notebook Paper Labels. 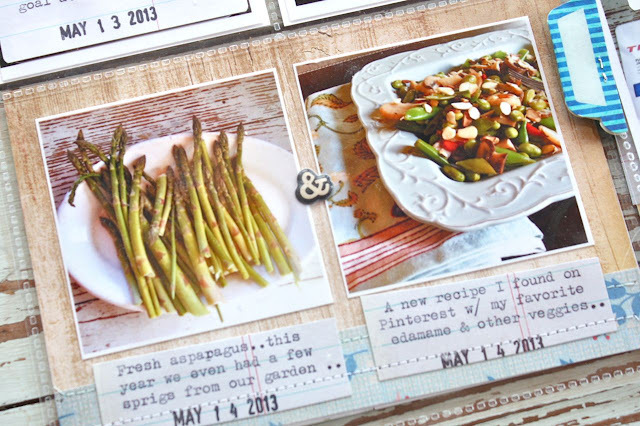 I love adding little ampersand embellishments in between the photos. Here I made a 4 x 6 flipper that opens to the right like a book page. 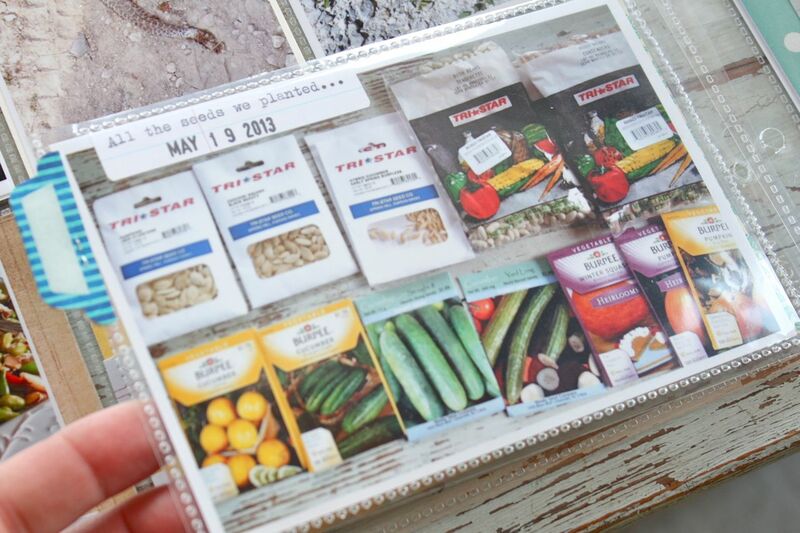 This photo shows all the seed packets we planted from this year. When the flipper pocket is opened there is typed journaling on the back side of the flipper. 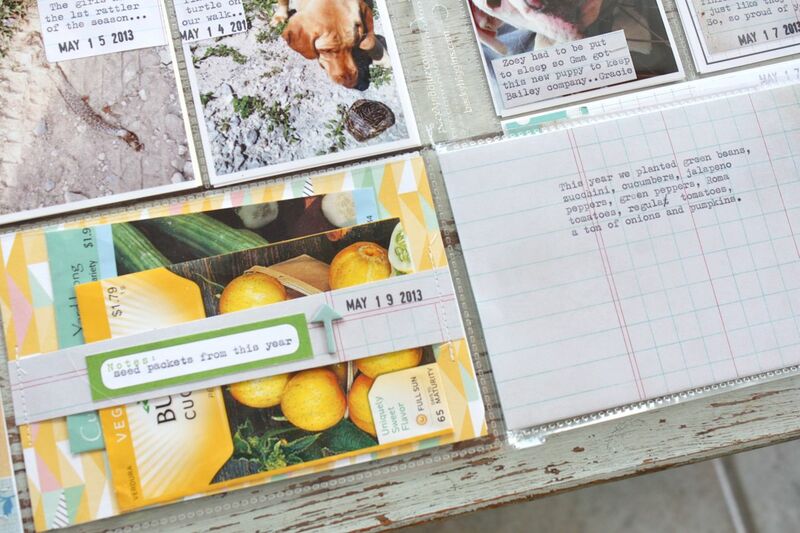 The other 4 x 6 insert on the left has a ledger paper band stitched onto it. A few of the seed packets I saved were slipped inside. I used my sewing machine to stitch on the trimmed down flipper page protector. School's out for Summer! I was lucky enough to get this photo of Jordan walking out of school because I was there to pick her up to ride to a track meet. I love seeing all of her bags filled with locker stuff. The typical weather shot and Jordan's text to me that she met her reading goal. Here I used another Notebook Paper Label which was cut in half to journal on 2 separate inserts. 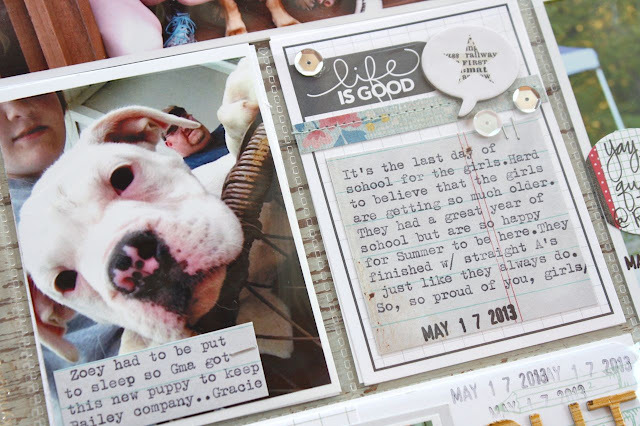 A new puppy for the grandparents and some journaling on an embellished journaling card I had in my stash. 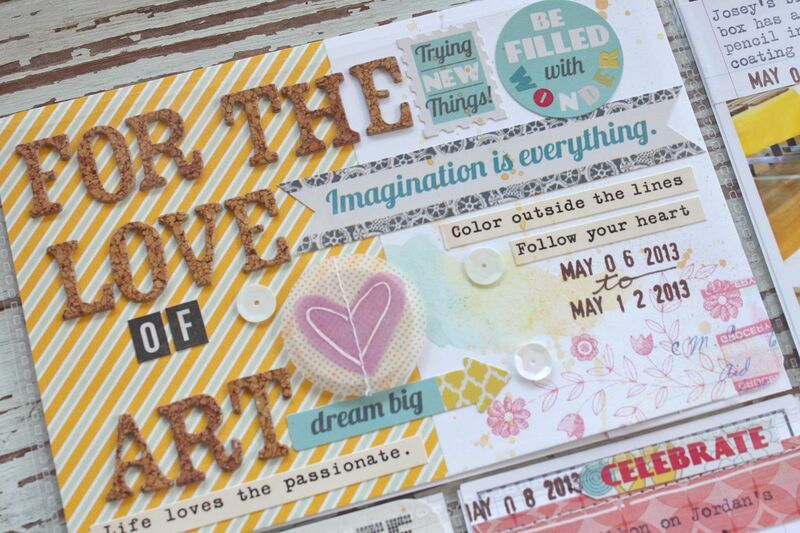 The sequins I sprinkled throughout the layout are from my Neutral Sequin Collection. Just a few of these left in the shop. A few inserts this week. This is the front and back of a 5 x 7 insert. 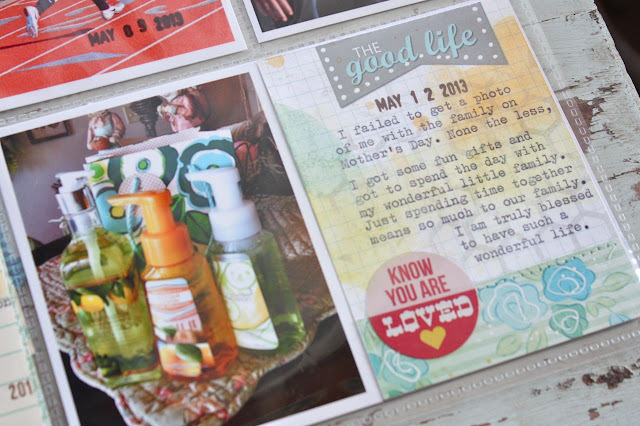 I used the Becky Higgins Project Life page protector. The left has a simple 5 x 7 photo with Elle's Studio journaling tag. The right has some birthday cards I received. Some more from the 5 x 7 insert. A little scrappy page about some vintage finds and more birthday cards. 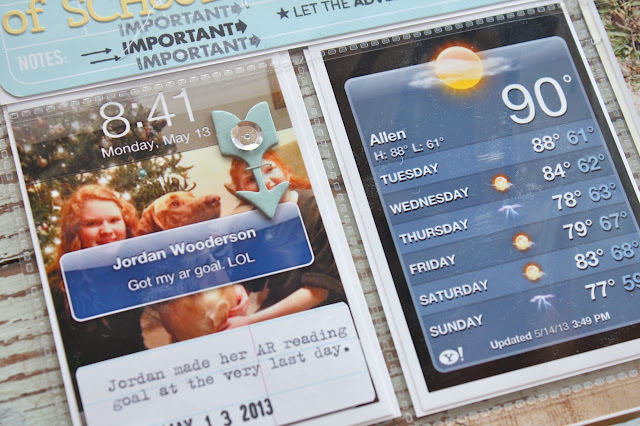 A close up of the vintage mini page. 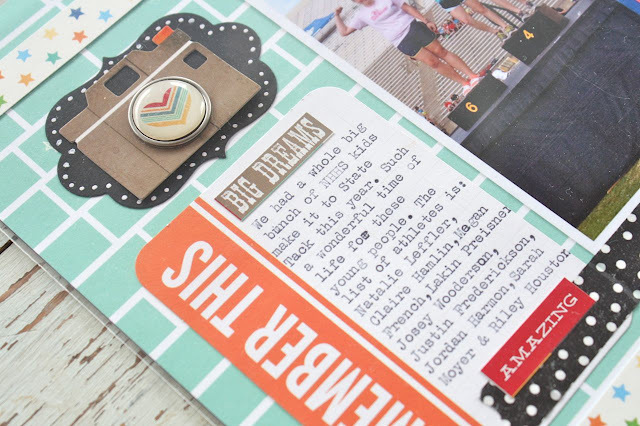 This size seems to be a perfect size for me to scrapbook. Much larger than this and I get stage fright. It's true, I can't scrap large pages for some reason. It's all in the books. A true fact for you....as of today I have ZERO...that would be NILCH, NADA, NONE....photos on my iPhone. I transferred to a new phone and I made it a goal to get over 1,000 photos emailed to my big computer. Done! I'm about 3 weeks behind on Project Life...down from about 9. That feels good too. How are you coming along? Hey there. 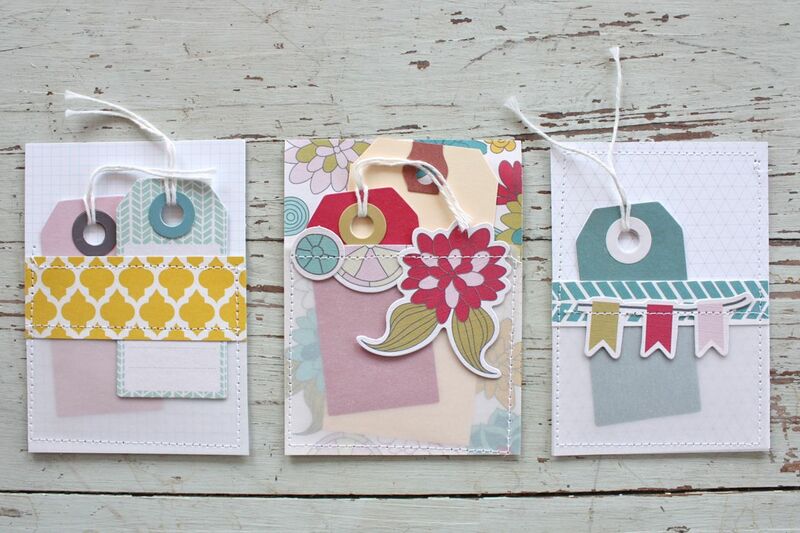 Thought I would share some creations for all the card makers out there today. Sometimes I just feel like sitting down and creating. No particular project in mind. No deadlines. Just a little stamping to see what I end up with. I had these stamps sitting on my desk, waiting to be inked up. The left is from Avery Elle, the middle is from Mama Elephant and the right is a set that I believe I got in a Studio Calico class (?). I grabbed a few blank Becky Higgins 3 x 4 journaling cards and just started creating. 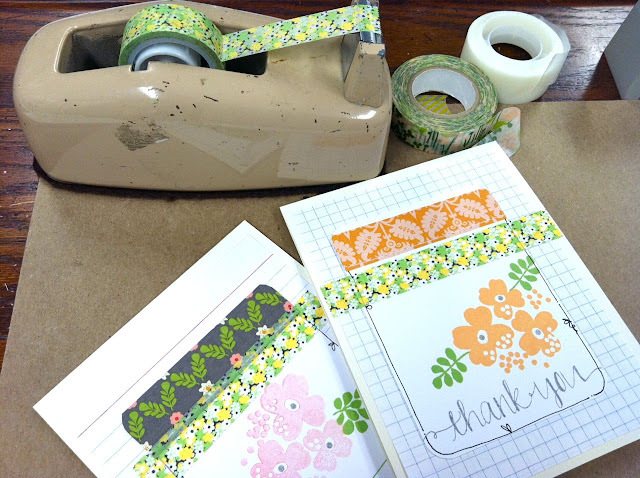 I started by adding some strips of patterned paper from my favorite papers from the October Afternoon Travel Girl paper pad. All of these fun patterns will be showing up in the August Gossamer Blue kits. I love that there are patterns mixed in that aren't all travel themed. 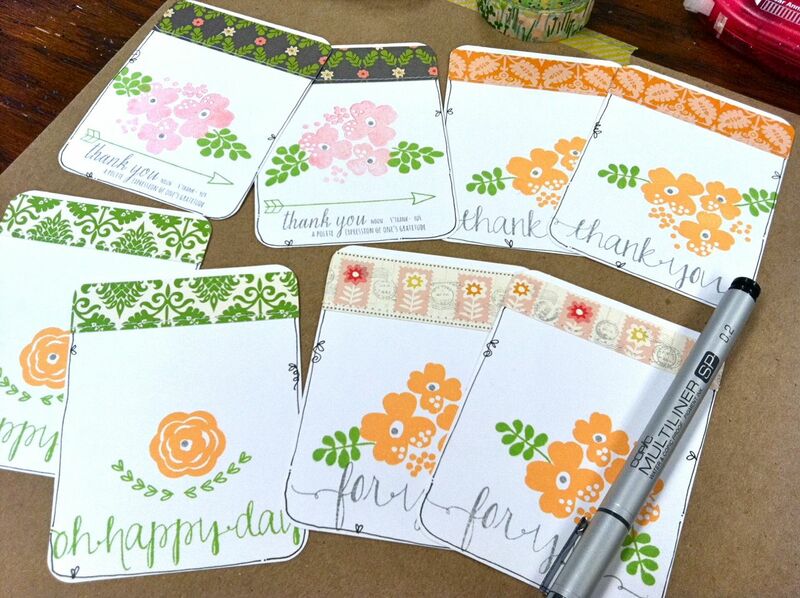 I then just started stamping some flowers and sentiments. I ended up doodling lines around the journaling cards with a very fine 0.2 Copic Multiliner pen. 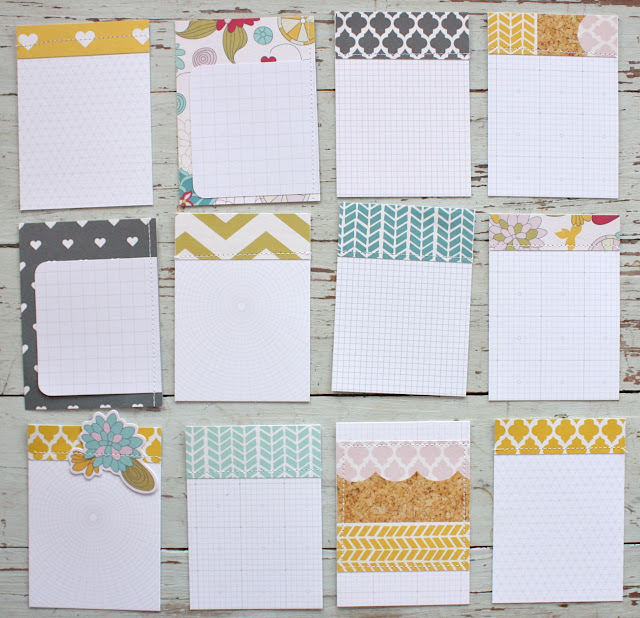 I cut some card fronts and added index cards and graph paper which I trimmed down. 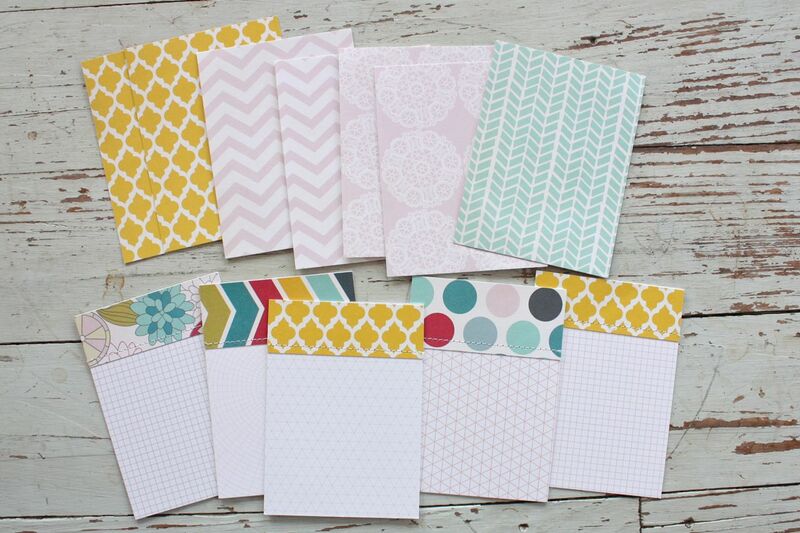 I've been reaching a lot for these office supply types of papers as they make great, neutral backgrounds. 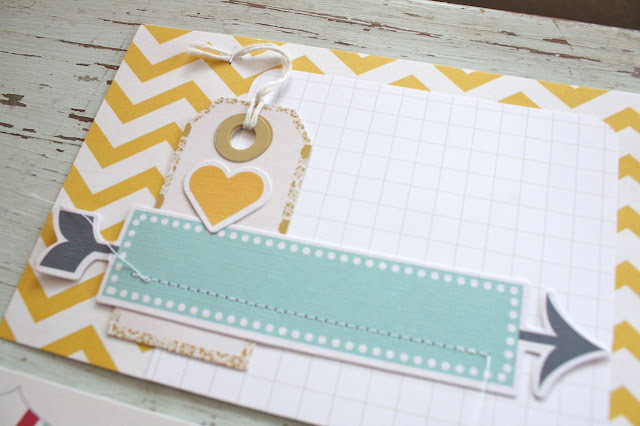 I added the journaling cards and then strips of Washi tape. When I'm mass producing cards I like to use my old tape dispenser to cut my tape. I like that even, torn edge. Here they are, all lined up like little soldiers. So fun and easy. Kind of whimsical but pretty. 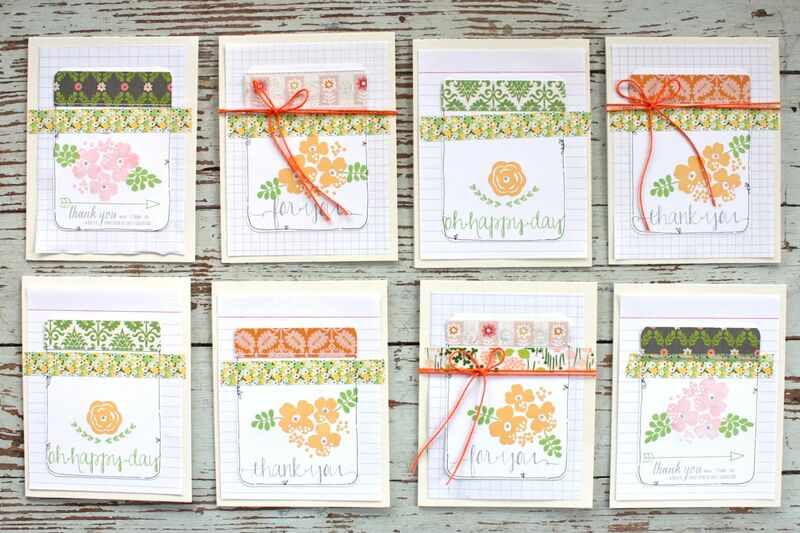 I added some orange vintage twine to a few cards. 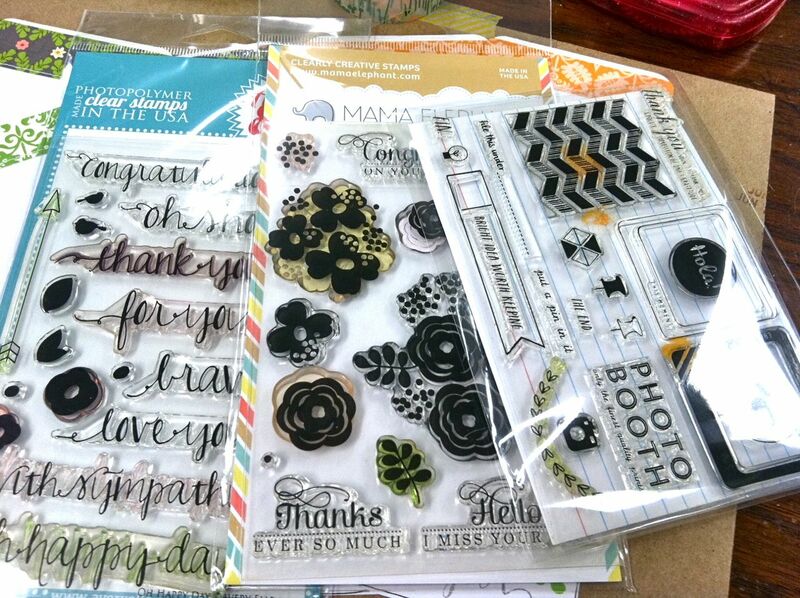 These took very little time to assemble once my stamping was done. It was sure fun just to fiddle around and see what happens. 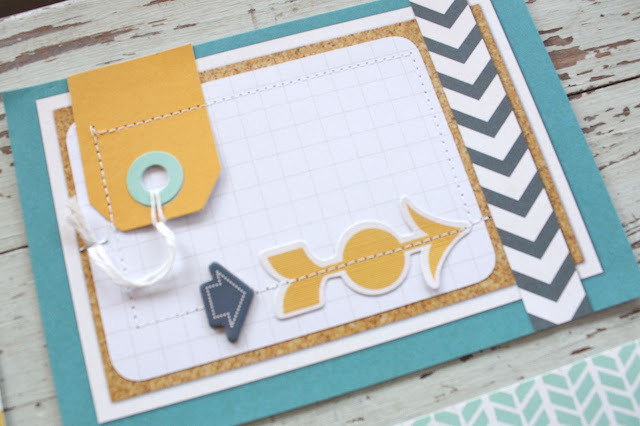 So tell me card makers, what have you been creating lately? I recently needed a sympathy card and a card for a friend who has breast cancer. Those kinds of cards can be tough but they are the most appreciated, I think. I really need to build up my stash for those types of cards as it's kind of hard to create a more serious card when you need one on the spot. 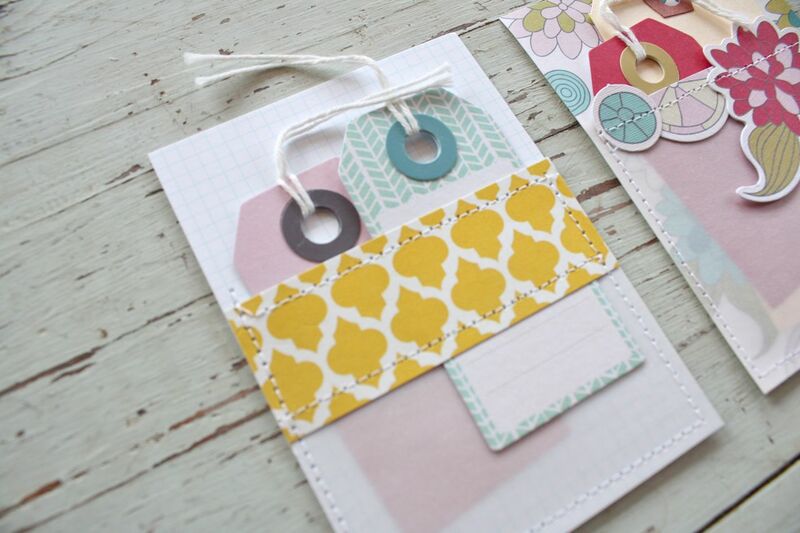 In shop news....all of my remaining card kits are on sale right now. 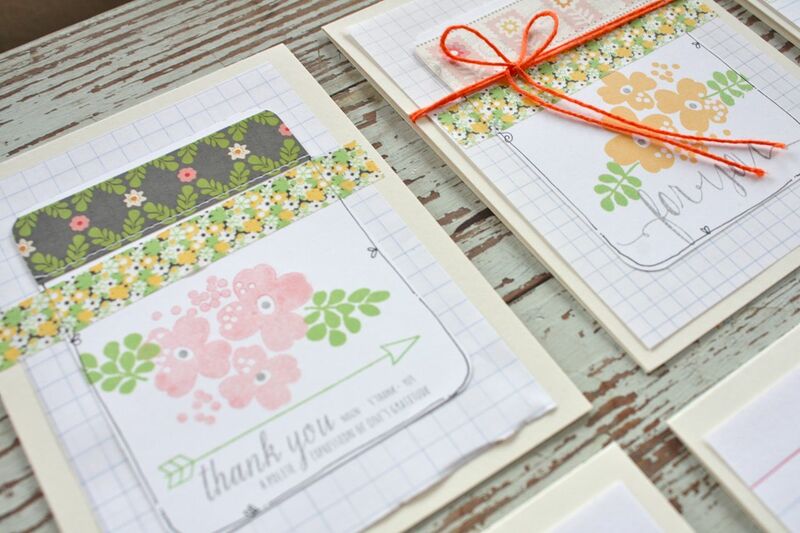 The Mixed Florals Card Kit and the Mixed Greetings Card Kit are still available. I also just added some finished greeting cards to the shop. 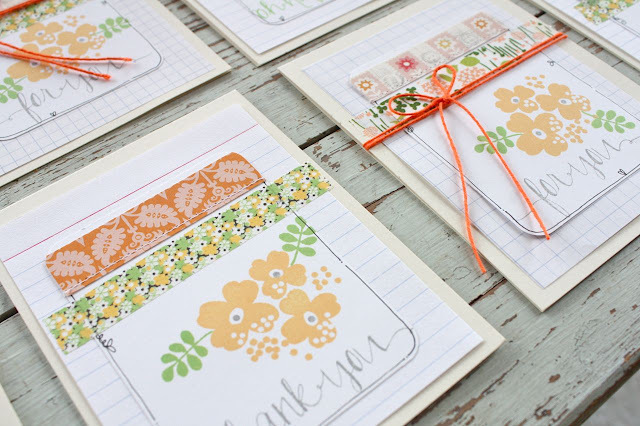 I'll be creating card packs to give to some teachers and school secretaries soon. 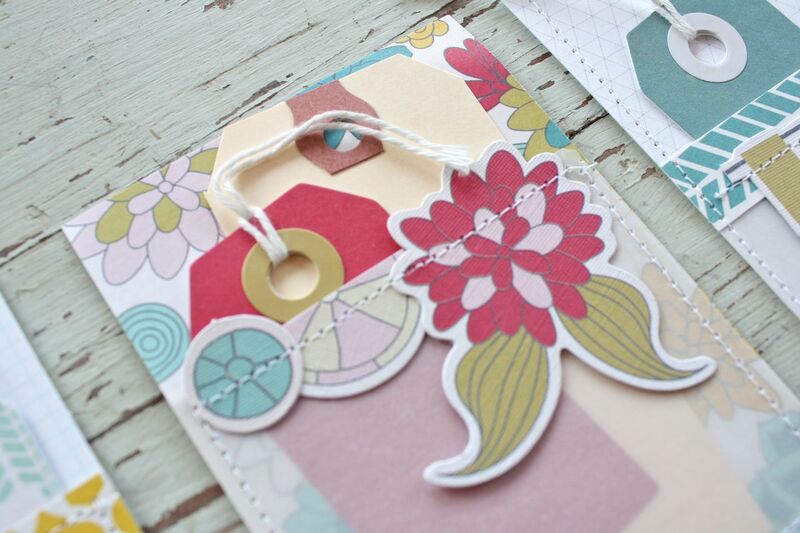 I package these in embellished sacks like the ones you can create with my Mellow Yellow Packaging Kits. All items ordered from my shop by this Friday will be shipped by Saturday. I'll then be taking the shop down for a week while I'm on vacation. As always, thank you so much for your patronage. It means so much. 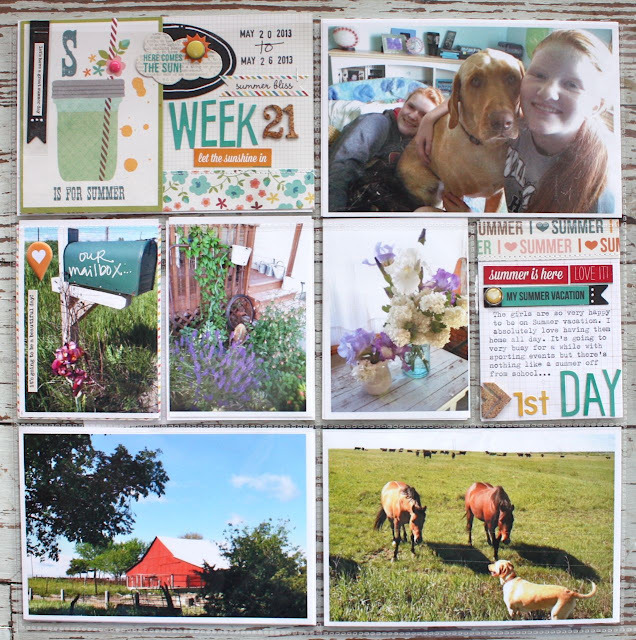 I have lots of Project Life weeks to share so I'll start off the week with Week 19. It was an art filled where the girls' Spring Art Show coincided with an art class I went to. A perfect week to add some artistic touches to my weekly spread. The 2 page spread, a photo in almost every slot. The left page which I used entire for the girls' Art Show event. Josey starts off my photos with her pretty bird seed box she made me. She carved out a bird and inlaid some resin material to make it colorful. I just treasure this gift she made for me. The right side which shows a few shots from my art class + winning League track + gradation and more. I created my main dated insert by making it reflect on the art theme for the week. Lots of stickers and fun embellishments + some loose watercoloring. Jordan stole the show...literally. Josey was not in art this year, just wood shop. 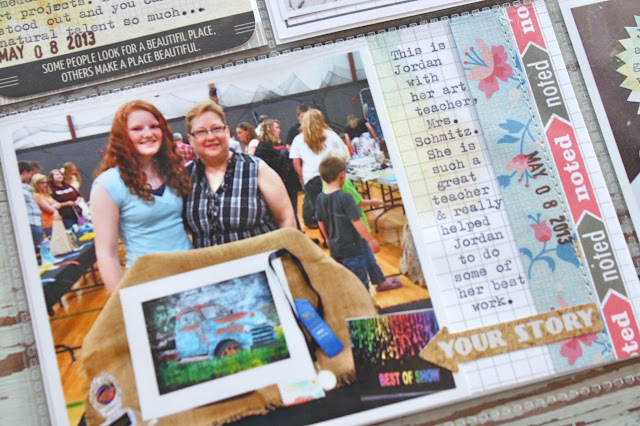 Jordan got Best of Show with her old pickup painting. It used a resist technique where you leave white areas that would take on a black painted finish. The result is a rustic looking painting. It was displayed front and center and I couldn't be more proud of Jordan. Here she is photographed with her awesome art teacher. Oh, how I love her. 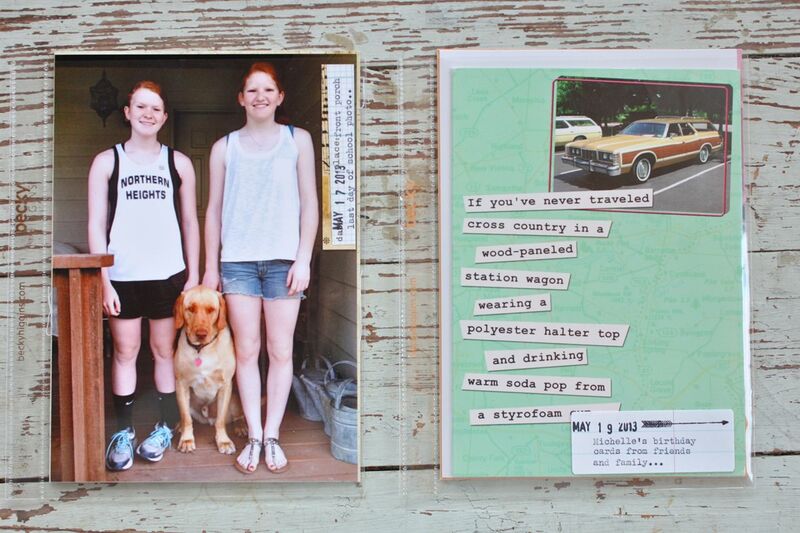 More 4 x 6 inserts, this one features me and my friend Carmen with Dina Wakley. 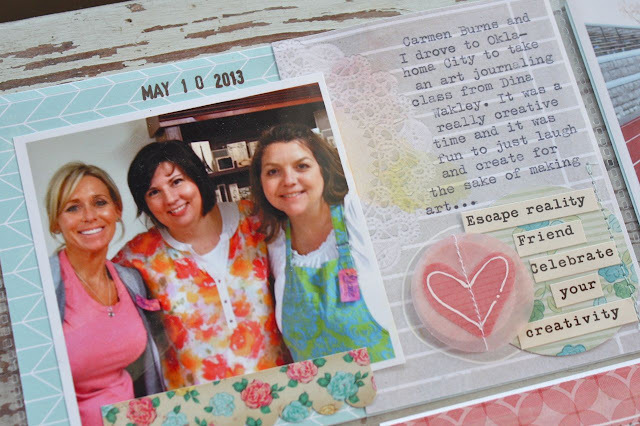 We road tripped to Oklahoma City to take Dina's art journaling class. It was a fun, fast and furious day filled with so many new techniques. The class was messy and covered so many new techniques. It was refreshing to do something just for the sake of creating....and a little out of my comfort zone. Some watercoloring that I did on a journaling card before adding the typewriter journaling. 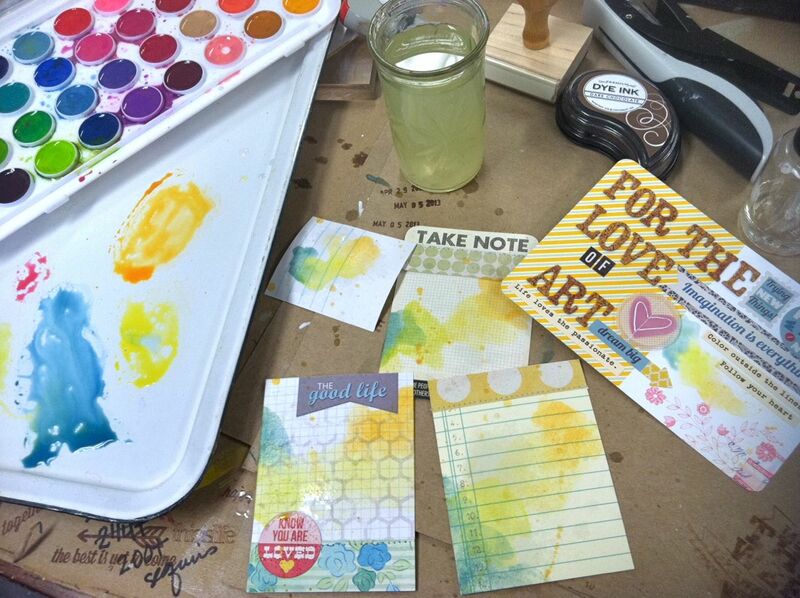 Another watercolored journaling card. Love how this gives a nice subtle color wash.
Back to the 3 x 4 inserts. 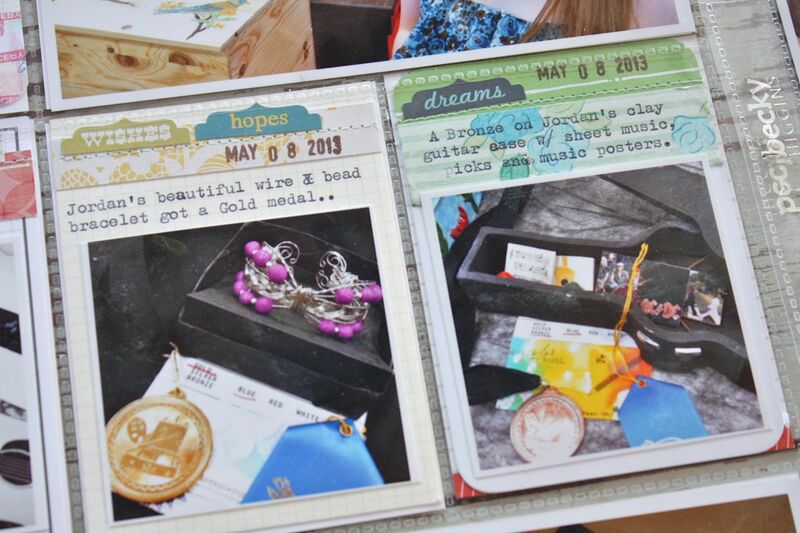 I photographed all of Jordan's projects on display with her medals and ribbons. It's fun to see the artwork here in mini photo form. This was her stippled guitar which got a blue ribbon. Here on the left is Jordan's wire and bead bracelet which got a gold medal. On the right is a fun clay project Jordan created. She made a guitar case with leather like texture, 2 posters (AC/DC and the Beatles), clay guitar picks and small sheet music pieces. Very clever. She got a bronze medal. 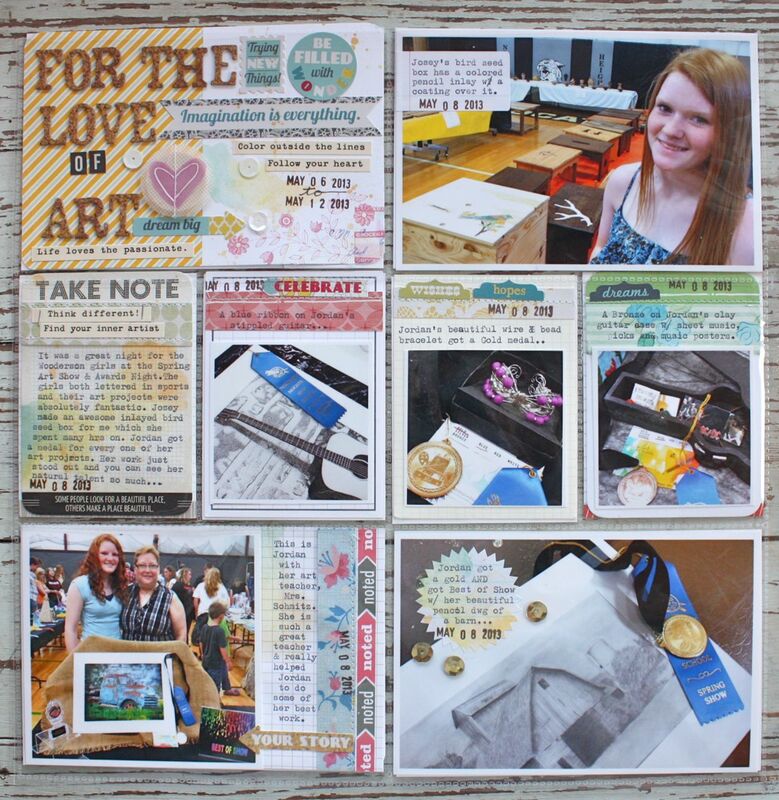 Love that I added these art events to my Project Life albums. Some day those art pieces may be long gone but the photos will still be here in print. It was a good week for Project Life. 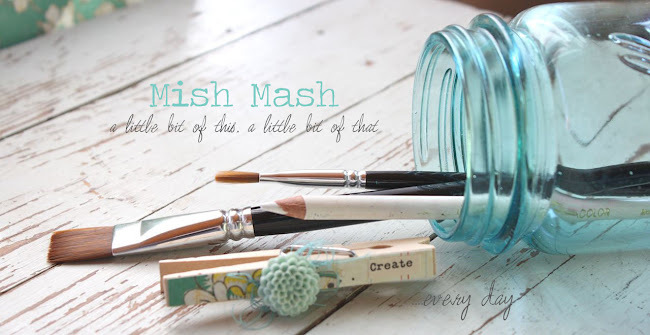 Today I'm sharing a post that also went up over at the Gossamer Blue blog this week. I have some wonderful little creations for my Life Pages using all Fancy Pants products.So you all know I love to embellish journaling cards for my Life Pages. 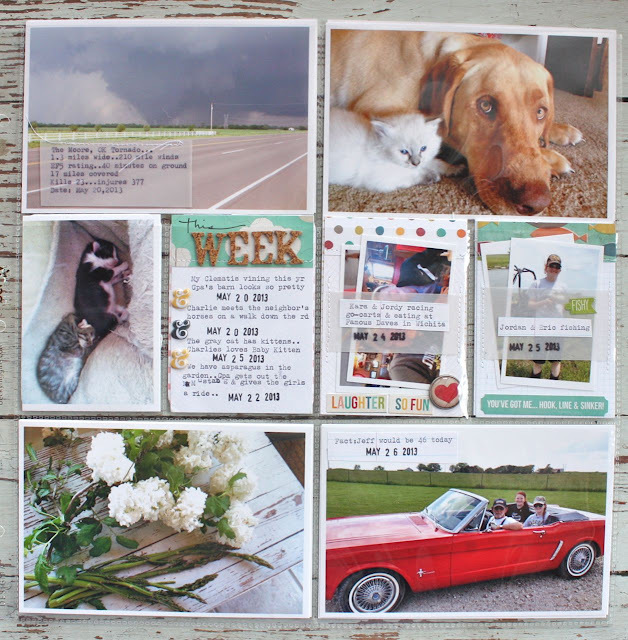 It was so easy to put together some fantastic pieces because the Fancy Pants kit items were just that good this month. 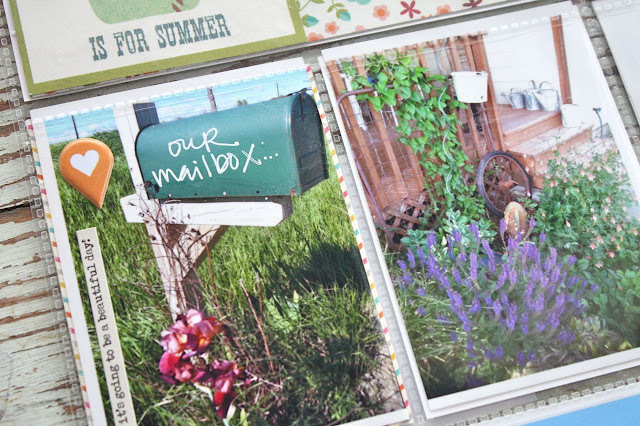 Here I have a collection of 4 x 6 inserts, some are straight from the collection, some are fancied up with embellishments. The 4 x 6 Brag Pad from the July Bits & Pieces Kit is wonderful for Life Pages projects. Here are a few that I embellished using tags from the July Bits & Pieces Kit and die cuts from the Fancy Pants Ephemera Pack in the July Main Kit. Looks like I used a few Project Life grid cards also. By layering, stitching and stapling I able to add so many fun elements, still leaving room for photos, journaling or my week # and dates. Now on to some 3 x 4 journaling cards. I almost couldn't stop myself but alas the family likes to be fed and wear clean clothes at times. For these inserts, I pulled various grid and pattern cards from my stash and then just started adding strips of patterned papers. The kits were full of fun Fancy Pants 12 x 12 papers. I used the backs and fronts to get lots of varied designs. The nice thing about these cards that I add to my stash is that they can be used all in one week to create a coordinated look or they can be spread through many weeks to create a mixy matchy look. 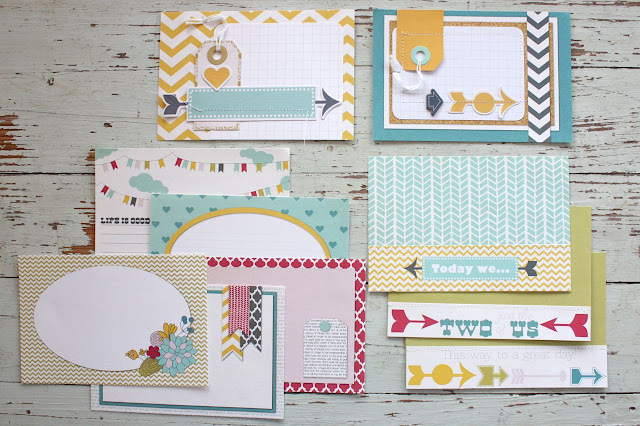 The designs and colors are clean and simple and fit into most of my color schemes. 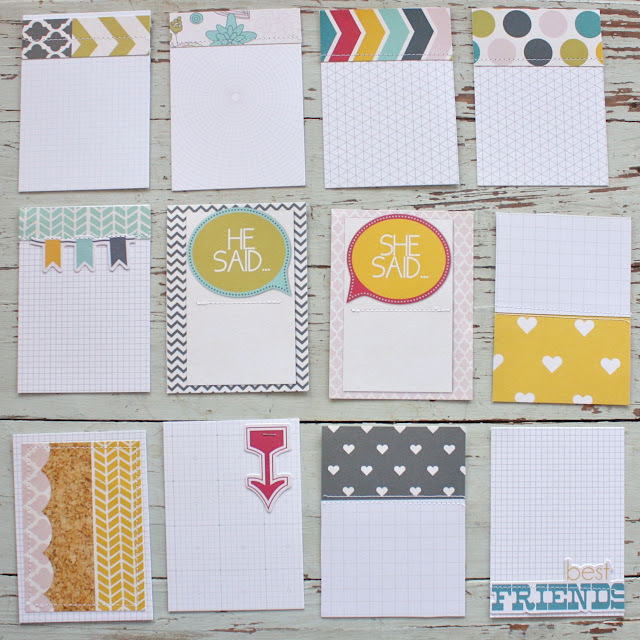 Here I got wild and crazy and created some fun 3 x4 vellum pocket cards. Each pocket has some Fancy Pants tags tucked in, ready for use. 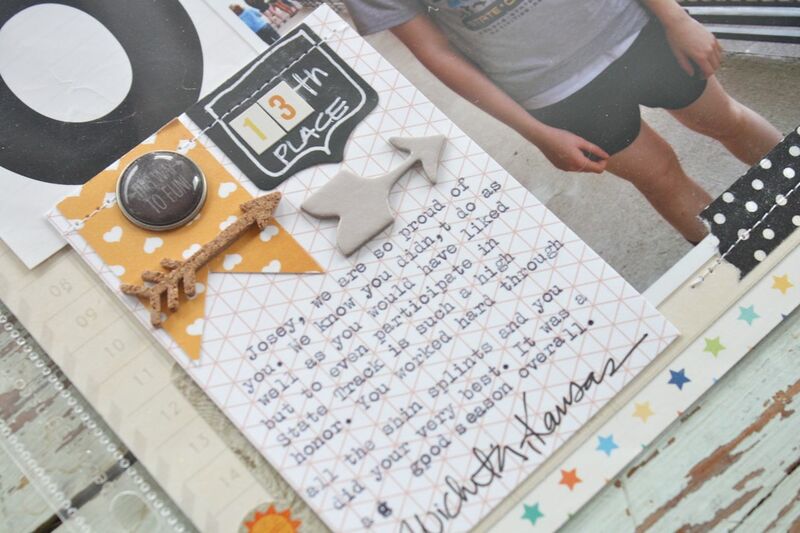 All I have to do is add another journaling piece or photo into the pockets. I just love these. Here I have a fun mix of tags.....the aqua tag is actually sewn in place and will be a fun landing point for an additional embellishment, maybe a flair button. The pink tag can be removed for journaling. 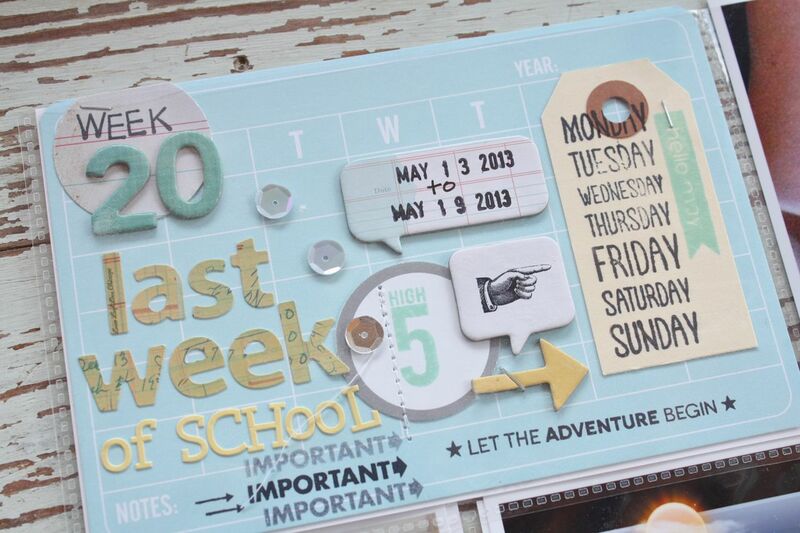 Here I used a fun die cut on the vellum. Two tags are inserted into the pocket. 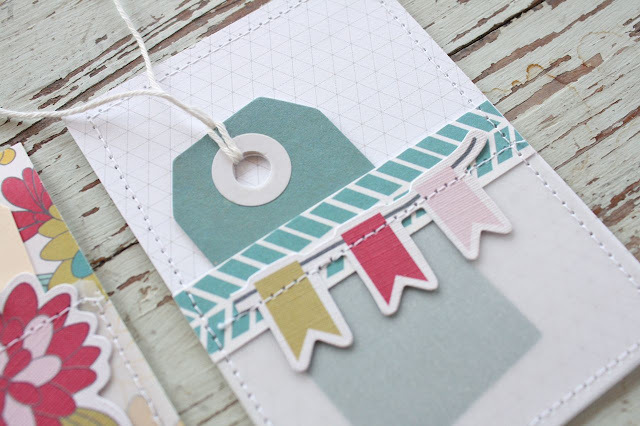 And here I trimmed a little banner die cut to fit onto the vellum pocket. A cute little tag is in the pocket. 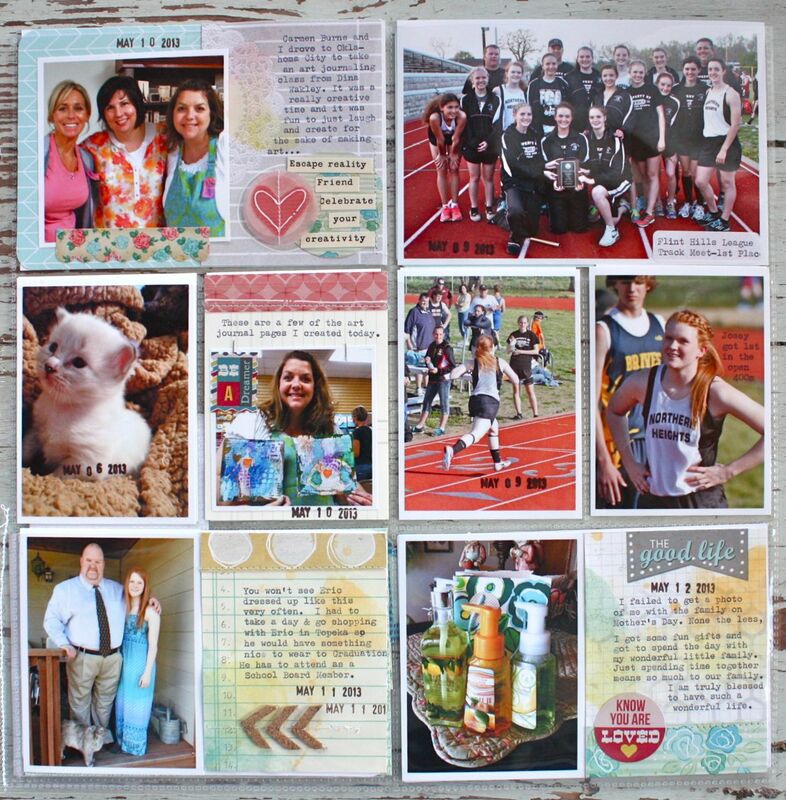 Since I couldn't stop myself, I finished up this fun crafty session with some final 3 x 4 cards. 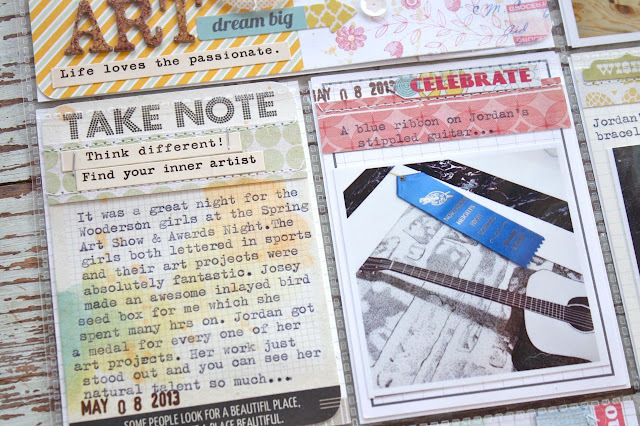 I loved some of the patterned papers so much that I just trimmed down some scrap pieces. I can add embellishments to them later as needed. Whew, I hope you enjoyed the results of a very fun day in the craft room. 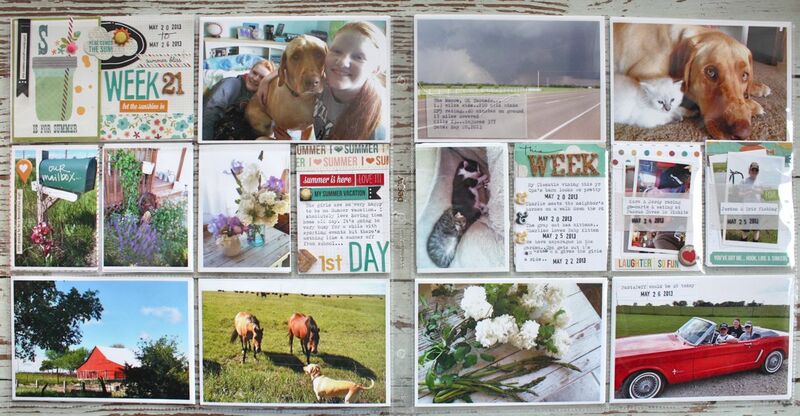 Right now I currently am keeping this collection together in a Project Life 12 x 12 plastic pocket keeper. I plan to knock out some Life Pages with them here soon in hopes of catching up on my pages. Then when I deplete the stash enough I'll mix the cards into my existing stash. Thanks for stopping by today. Oh, and one final note..Gossamer Blue and Fancy are sponsoring a very special contest. If you'd like to be a guest designer for both companies you might want to check out the contest details at this post.